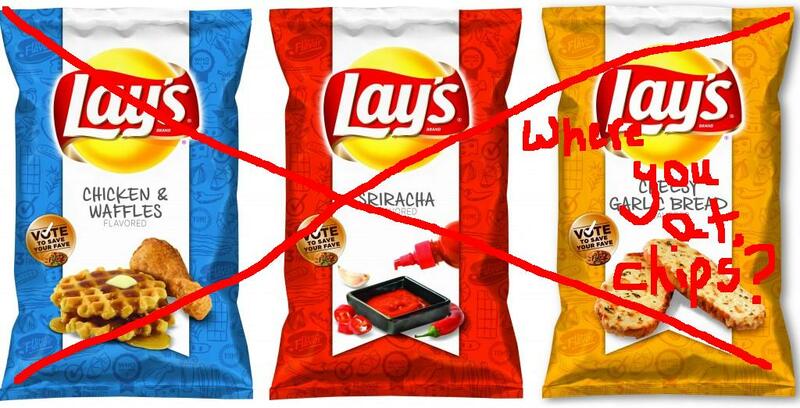 Rant: Lay’s Potato Chips | Food E.
We’ve got them all down here in Raleigh, Lauren. But the chicken and waffles were so gross we didn’t go back for more. They tasted like chicken and waffles confit, in a bad way. Like it had all been sitting on a breakfast buffet for hours. Syrup included. Too heavy for me. Joe ate them, but that’s not really saying much, that beast will eat anything. that sounds absolutely disgusting! when they started this promotion i wondered about sweet chips but i guess now we have our answer. blech.